I began the good work in you and I will finish it. will complete it until the day of Jesus Christ. It has always been His work, not ours. It is God's heart, God's vision, and God's power that will bring about all that He has planned and purposed in our lives. That is why the Apostle Paul encourages the Philippians in today's promise to be confident in knowing that the One who began a good work in them would would perform it until the day of Jesus Christ. The NIV Bible says that God... will carry it on to completion, the NLT Bible says that God ...will continue his work until it is finally finished. Whatever translation you prefer, be encouraged in knowing that God has committed His whole heart to you finishing your race. 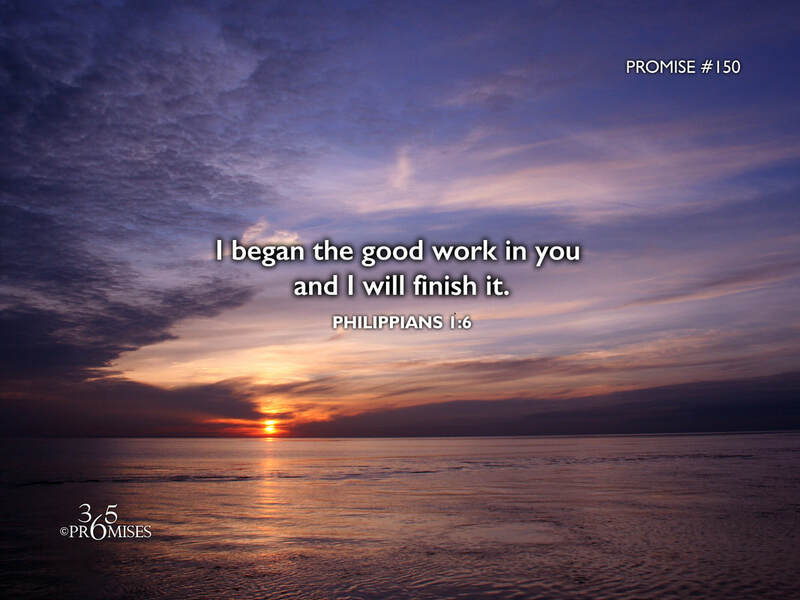 He started the good work in you and He will finish it on the day that our Lord and Savior Jesus Christ returns to bring us home.